Today begins my four-month term as a member of The Creative Pointe's Premier Design Team. In celebration and as a part of the Mom's Day Blog Hop (thank you, Nicolette! ), I posted the first card I made using the fun files at Diecut Designer. Scroll down to see that post, if you missed it. Here's my second card made. Am I loving these SVG files, or what?! I backed the daisy pot using paper from The Daily Grind stack from Fancy Pants Design. The clouds were cut from a Nikki Sivils paper, matted in white and lifted with mounting tape. The butterfly and daisy center button are from Recollections embellishment packages I found for half-price at Michaels. I also used a Fiskars (Treading Water) and a Martha Stewart (Eyelet Lace) punches, white gel pen for faux stitching, and an Action Wobble under the butterfly. Star asked a couple of questions that I thought deserved answers here for those who haven't yet ventured into the world of SVG, SCAL, etc. Q. What does SVG stand for? A. SVG stands for "Scalable Vector Graphics." An SVG is a bridge between design (such as a JPEG file) and programming, so that XML code can drive the cutter like a hand would drive a pen. An SVG can be modified by the crafter doing the cutting (like me!) by scaling -- or dragging points to enlarge or stretch the image to the desired size, without having to know XML code. A. SCAL is the user's abbreviation for the proprietary electronic cutting program known as Sure Cuts A Lot. SCAL has been developed by The Craft Edge. It is sold to end-users like myself to use as a program that takes the millions of SVG files available and cut them on your electronic cutting machine. Q. Does SCAL still work on a Cricut? A. Yes, SCAL works with Cricut. Many of us bought a Cricut because it is an affordable option that allows us to cut SVG files. At this time, there is a lawsuit pending against SCAL, filed by ProvoCraft, in which PC alleges copyright infringement among other charges. A similar suit was launched and settled earlier this year, against another cutting program, Make The Cut (MTC). Under terms of that settlement, MTC may not sell their program to cut using a Cricut, and had to disable their most recently upgraded program that allows Cricut users to download and save files from a Cricut cartridge. Q. If you use an earlier version of MTC, will it still work on your Cricut? Yes! Only the upgraded version of the program needed to be disabled under terms of the settlement. For those (like me!) who never upgraded their original program, it still works fine and is supported by MTC. Do not upgrade your version in the future if you plan to continue to use your Cricut. Q. Whoa! Are there other electronic cutting machines other than Cricut? Yes! Cricut captured the home-based crafter because it offers an affordable option, using cartridges that do not require a computer or computer knowledge. But graphic artists or those who want to use SVG files often use a more powerful, deeper-cutting, and yes, more expensive cutter like Pazzles Inspiration, Silhouette, Black Cougar, Lynx, and more. Because many crafters are disappointed with Cricut's lawsuits, some are refusing to purchase new cartridges, and are saving their money to buy SCAL, MTC or Fairy Cut, and a new electronic cutting machine. Q. Do the electronic cutting programs run on MAC? A. I use an IBM-compatible PC, so I haven't had to try this directly. However, I have seen in an MTC Forum that MTC will work on a MAC if you run it through a parallel or VMWare Fusion. (Please don't ask me what that means -- I'm no computer geek!) SCAL does sell a version for MAC. Fairy Cut is not yet available for MAC. Q. I'm not a computer geek, either. How easy or hard is it to use SCAL? A. If I can do it, you can do it! 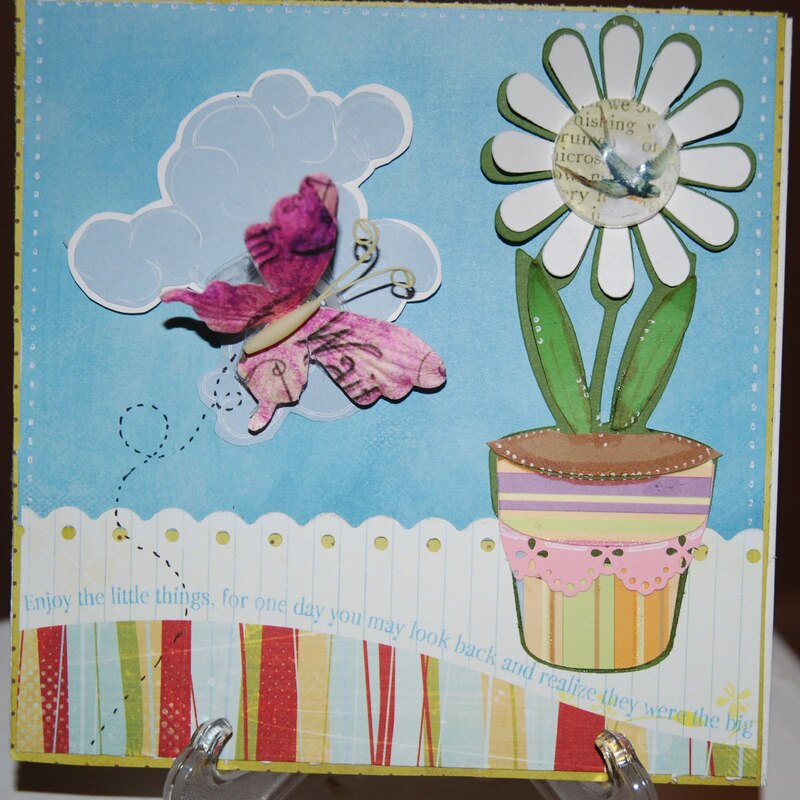 There are a significant number of tutorials at The Craft Edge, as well as online. I took a short course at my LSS; it was well worth the money! Q. Oh come on! I need a glossary!! What's an LSS? A. Oops! LSS is "Local Scrapbook Store." Do you have more questions I can answer for you? I'm happy to keep the Q&A going, on any cardmaking or scrapbooking question, technique, product, etc. If I don't know the answer, I can research it for you and get back to you. Do you have other abbreviations that puzzle you, too? One that troubled me for a long time was CAS. Finally, just this weekend, I learned it means "Clean and Simple." Do you have others? Share in a comment, please! Great job on the flower in a pot...great minds think alike...my next design was going to include a homemade button for the flower center! Thank you, now I know what some of those abbreviations mean! You are a wealth of information!!! And so generous in sharing with us. Thank you, thank you, thank you!